Betting on small-footprint servers and high-efficiency mobile encoders. Netflix seems remarkably, perhaps professionally, unfazed by Amazon's Prime Instant Video download offering, despite the general air of positivity that's greeted its rival's recent unveiling. When we spoke to Neil Hunt, Netflix's Chief Product Officer in the environs of IFA last week, he had a different take on the industry, still championing the streaming model as the way of the future. "I feel like what consumers want is not the download model," Hunt told us. "What they want is the ability to consume anywhere they happen to be. And that might be on a plane, on a train, in a car or outside." Netflix then is remaining resolutely focused on streaming over downloading, claiming there are more interesting directions to take video in rather than just shifting towards the old download standard. "One direction we can take is our open connect servers – which is a small box, essentially a whole Netflix footprint in a little package that doesn't use much power," said Hunt. "We built those servers so we could place them inexpensively in internet exchange points and peer with the broadband networks." "The thought experiment is what if we deployed those boxes on planes alongside or instead of the inflight entertainment system. Then you'd have Netflix streaming on a plane without requiring excessive air to ground bandwidth. It's a thought experiment that actually seems fairly practical." Practical it may be, but with most airlines having already established inflight services it might take a lot to encourage them to add, or switch to, a Netflix system. It may have more immediacy than a pre-planned Amazon download setup for your long haul plane journey, but it's unlikely to ever be as pervasive as what you can take with you. The more interesting proposition though has Netflix signing up to the Open Codec Alliance to help develop a next-generation, high-efficiency codec for streaming on the go. 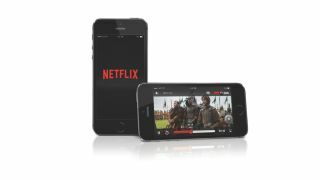 Netflix is joining forces with Facebook, Microsoft and Google to put together this royalty-free, or low-royalty, high-efficiency encoder for mobile streaming. "What we've seen in the past few years is the energy has shifted from EVC encoding to HEVC encoding to support 4K imagery," said Hunt. "HEVC does very little for a 10cm screen – there's not a lot of efficiency gain there. We've focused our energy on trying to build the next generation of encoder that's particularly efficient for small screens and very low bandwidth." If the level of data required to get a good video streaming experience over a mobile network isn't suddenly going to destroy your data plan, or your wallet, then that could be a much more intriguing proposition than the download model. "The stretch goal I would like to achieve is a decent picture on a 10cm screen at 250kbps," said Hunt. "That suddenly begins to put a typical Netflix consumption pattern – 30-40 hours a month – within reach of a mobile plan."